Sure, Batman formed the Justice League, but she's in charge! 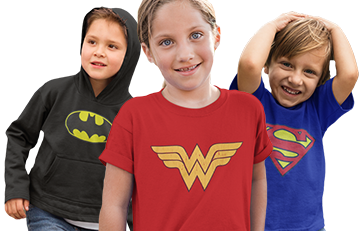 Official Wonder Woman t-shirt based on the hit film, Justice League. An ancient symbol that inspires a modern world. Wonder Woman has been Wonder Woman-ing for hundreds of years -- her godly-bestowed armor and steel-woven symbol implies a tumultuous history involving a LOT of swordplay. She bowed out for a while, but the 'fall of Superman' and this mortal, bat-themed hero inspired her to, once again, bring peace to man's world. Unfortunately, that will involve more swordplay. -- it's a commanding design upgrade adorning the warrior princess' godly fatigues in Batman v Superman, the Wonder Woman movie, and, of course, Justice League. 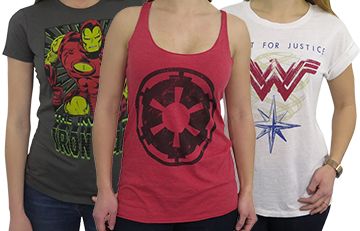 Available in flattering Standard and curve-hugging Fitted sizes, this Wonder Woman t-shirt for women reaffirms Wonder Woman's commanding presence in the new DC Comics Cinematic Universe with some seriously powerful iconography. The shirt is great quality with a length and fit that is just right. I think it's nice and very well made. The terrible person I have it too really liked it. 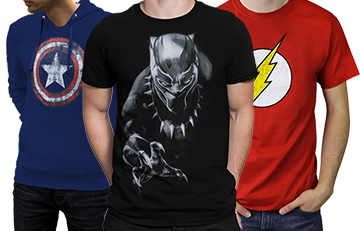 Great T-shirt--good quality, nice length, prompt service. Sorry to hear it didn't fit Mandy but we do appreciate the feedback, I will share it with the team. Nice to FINALLY find a woman's superhero shirt that isn't super snug and fitted.